Posted Mar 01, 2018 by Eds. Last September, Verge writer Cat Ferguson uncovered that Google had unwittingly allowed shady generators to manipulate its AdWords system. The fallout from this article revealed that high-cost ads based on rehab keywords actually referred users to telephone hotlines that gave the impression of being independent information services. The reality is that these services were owned by treatment centre conglomerates. In response to Ferguson’s article, Google pulled all its AdWords marketing for addiction treatment. Just last month, an interesting story emerged from a number of small new websites that discovered they had been delisted from Google News without any explanation from Google initially. Some hypothesised that this delisting of smaller companies was due to the recent search engine optimisation changes, while others are more suspicious as to what is happening as various message boards gave regular updates regarding the situation. This recent turn of events is vaguely familiar to what happened several months back. On January 8, Google announced that it would be fixing this “mistake” and reinstating pages by the end of the day. Google News engineering director Maricia Scott acknowledged the problem, apologising for it. Yet many news sites are still left stranded, with many more still commenting on Google’s ProductForum boards even today and highlighting ongoing problems. Many news sites that have been covering the ongoing cryptocurrency market shifts, such as Coinspeaker, still claim that they remain delisted despite numerous attempts to reinstate them with Google. Additionally, of all the news sites covering the recent cryptocurrency shifts such as Unblock, it is hard to understand exactly how Google’s delisting entirely disadvantages them since some demotions are due to story quality, grammar, proof-reading, and various violations of Google’s rules that prohibit data and advertisements instead of a focus on events. And these companies are free to adjust their content and request their site be relisted. One of the culprits of this turmoil is Google’s recent changes to recalibrate its search algorithms to improve quality, trading algorithms that interface with Google Cloud Platform or problems with its Street View panorama algorithm — Google has enormous influence in defining news, information and facts. When Google’s systems fail or an update causes incorrect information to circulate the internet, people’s lives are greatly affected. And upon closer scrutiny, it is distressingly clear that Google has way too much power over people’s lives and many small businesses. When you look through the vast list of businesses affected, an entire range is there from sports to investment to data management websites. Yet businesses depend upon Google from all professions and trades, be it wedding planning or wedding rings, be it growing a business or a plant. And it is time that we question the hypercentralisation of all social, professional, public and private organisations through one single company. It would seem that Google is all for “free speech,” but only the type of free speech that it approves of. In June 2017, in-house scholar Barry Lynn was ousted from the think tank New America after he praised the EU anti-trust regulators who levied a $2.7 billion fine against Google. Having received more than $21 million from Google helping to establish New America as an important voice in policy debates on the U.S. left, it was clear from Lynn’s sacking that not only had Google help shape the debates of New America but Google was controlling the discussions. Aside from controlling more elite voices, Google has exerted control over its subsidiary YouTube and has been accused of censoring the videos of a handful of users. At the end of July 2017, Canadian professor Jordan Peterson was banned from YouTube for a couple of days in August with little explanation to Peterson. Then in August, Diamond and Silk, two African-American women known for their vocal support of President Trump, found that most of their YouTube videos had been stripped of the right to monetise. It wasn’t until October 2017 that Google acknowledged that YouTube was censoring conservative and other voices after being hit with a lawsuit by radio talk show host Dennis Prager. What we should all be worried about today are not only governments that use corporate giants to spy on their citizens, especially with new laws being created throughout the EU which very much resemble Britain’s Investigatory Powers Act, but we should be even more concerned by the fact that Google is a monopoly with enormous power to censor and to advance fake news and advertisements. 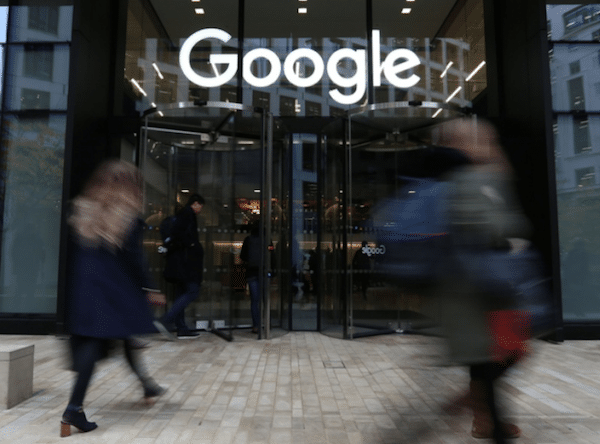 Since October, Google has been cracking down on how it treats various left-wing news sites, responding to criticism that it has been too censorious of the right. And alongside Google, Facebook has been responding to criticism of its policies that allow for fake news to proliferate or the charge that Facebook was instrumental in putting Trump in the White House as just before the 2016 U.S. elections, Trump’s campaign spent approximately $150m on Facebook ads. In light of last summer’s EU ruling, there needs to be a wider debate on both sides of the aisle as to whether Google and other giants are in fact dangerous to democracy. For a company whose motto for Google’s code of conduct used to be “Don’t be evil” and is now “Do the right thing,” Google is failing miserably to live up to its supposed ethos.